Neither the passages before, nor those that came after gave any clue as to what Curot meant. At first, I based my interpretation on modern experience; I thought Boisvert broke the ax’s handle, but breaking an ax handle did not seem noteworthy enough to include in the journal, given the unique nature of the other circumstances recorded that day. If a splintered wooden handle was important enough to write about, then there should be similar entries in Curot’s journal, or those of his contemporaries, but I find none. I now believe the iron ax head broke. 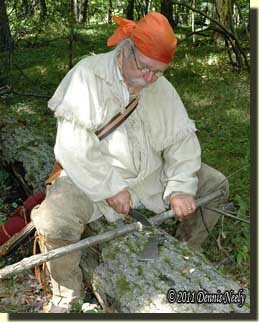 As a traditional black powder hunter, I learned long ago that wilderness classroom lessons have strange beginnings. A few weeks after reading Curot’s journal, a fellow asked a vendor at the Kalamazoo Living History Show for replacement tomahawk handles. Then during spring turkey season I “remodeled” a fallen tree top. As my hawk hacked and hacked, I paused and held the product of David Monds’ anvil in my hands. The handle was a work of beauty: sanded smooth, fire-striped and finished with a dark stain. The handle, at least, was hardly a working woodsman’s tool. This lump contained 29 axes (Ibid, 82). Portions of the crate’s pine boards still clung to the rusted mass, and Breede’s drawing shows the axes stacked in a manner indicating they were not yet hafted (Ibid, 29). On the Basswood River, the underwater archaeologists found 36 axes, along with 19 ice chisels and 6 spears. The recovered ironware weighed 73 pounds, and allowing for rust, the researchers postulated that the find was all part of the same crate (Ibid, 69). 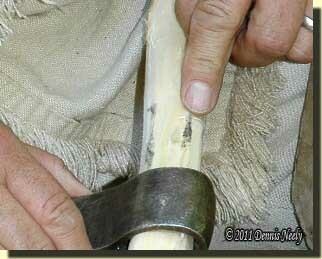 When I purchased the tomahawk, Monds, a seventh generation blacksmith whose ancestors made similar hawks for the Hudson’s Bay Company, explained that the haft’s dark rings were “forge burned.” He stated that when a hunter asked a local blacksmith to forge a new tomahawk or belt ax, the blacksmith furnished the handle. But what of the hired hunter who traded two prime beaver pelts for an ax from a North West Company post in 1794 (M’Gillivray, 31)? 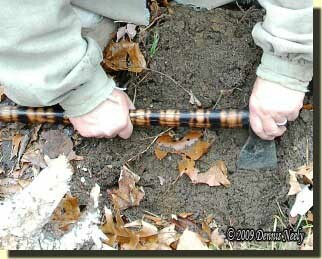 Or what did one of Little Turtle’s Miami warriors do when a tomahawk handle broke at the Battle of Fallen Timbers in August of that same year? 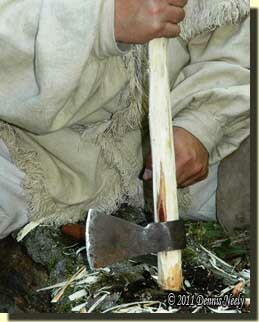 I wondered if Monds would be upset as I thumped the grip end of the HBC tomhawk’s handle hard on a melon-sized rock. It took a half-dozen tries to free the head. 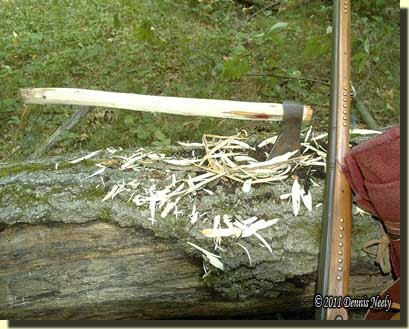 Following Jonathan Alder’s advice to young Tom Springer, I entered the glade with Old Turkey Feathers, a butcher knife, my blanket roll and the tomahawk’s head, the bare necessities of a backcountry woodsman (Alder, 126). Using the hawk’s eye as a guide, I selected a broken-down wild cherry sapling with an almost straight trunk. I leaned the trade gun against a nearby oak, pulled the butcher knife from its leather sheath and started whittling a “felling notch” in the cherry. The first cuts were shallow and hard; I soon learned two hands controlled the blade better and sliced deeper. I notched around the tree’s little trunk, but grew impatient as the sapling started to wobble and broke it off, leaving a splintered stub. On that warm August afternoon, I sat in the shade on a fallen oak trunk. Using the Biblical cubit, the distance from my elbow to the tip of my middle finger, I measured the cherry sapling, added a couple inches for final trimming and mistakes, then whittled the handle blank to length. 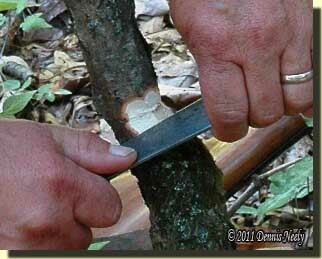 With the haft’s grip end pressed firm against the log, I first tried peeling the bark using the hawk’s sharp cutting edge, but quickly switched to the butcher knife. The blank had a natural curve to it, so I sliced a flat spot on the handle to remind me how I wanted to orient the head in relation to the curve. Long, cream-colored sapwood shavings fell away, and soon the hawk’s teardrop eye slid onto the blank. With a few more slices, the forged head moved up the handle. The eye’s inner surface left faint, black marks where the wood was too thick. By whittling away the marks, trying the head again and then cutting away the new black lines, the head inched farther. Halfway up the blank I realized that after removing all of the bark, the head end of the handle might not fit as tight as I wanted. Like most lessons in the wilderness classroom, the quality of the final result is dependent on learning through trial-and-error experimentation. Even though the sapling appeared dead, the wood was still green and shrinkage from drying was a certainty. As the head approached the end of the blank, I stopped with the idea of letting the wood dry out before the final fitting. I wondered if the old woodsmen sped up the final fitting process by slowly drying the blank over the evening campfire, for that is what Native Americans did with fresh scalps. With the eye’s fit still an issue, I decided to continue the lesson, knowing I needed to try again with a larger sapling. For the final few inches, I took thinner cuts with the butcher knife, scraping away fine marks rather than removing too much wood. I pounded the haft’s head end on the log more often, seating the forged eye firm, then thumping the grip end to release it. Finally, I was satisfied. The tomahawk’s head held tight through repeated tests over the next several days. After three or so weeks, the cherry handle seasoned to the point where that no matter what I did I could not keep the head from moving when it struck a limb. The next handle took longer to make, but remedied the first’s imperfections. I now have a tomahawk hafted in the wilderness, a woodsman’s tool that possesses the feel and look that I expect Joseph Boisvert’s ax had. Another great job! This was truly a good read. 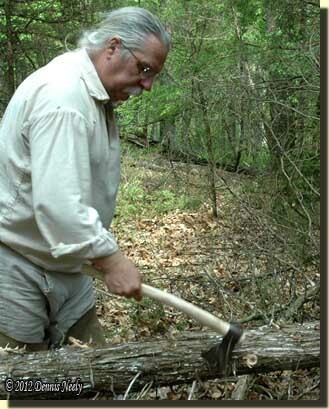 It reminded me of a spring training weekend at a small outpost in Ohio, one of the Rangers dug through the wood pile until he found a piece of suitable hickory and while sitting around the fire he made a handle for his ax. It was interesting watching him shape the piece of wood while everyone else carried on with there duties of clean there fowler’s or preparing a evening meal. It was just a simple task but it added so much more to the atmosphere of the weekend event. Thanks for that reminder of another “chore” commonly done, but mostly fogotten about as we pass back and forth from then to now. I have several bag axes, tomahawks, and hatchets that are haftless and I have been waiting for the trader to come ’round with his goods. Maybe I need to take a look at that downed maple tree top for a useable handle? PS…I have used the t’hawk head and my knives as scrapers in the past, and find I can do a much better job getting the wood gone where I want it gone that way. Thanks for the article and encouragement. 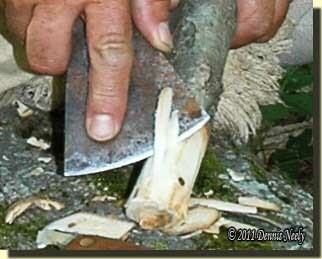 I have also come to appreciate the knife as a scraping tool, not just on wood, but also on horn or antler. It’s all about relearning the woodland skills our hunter heroes took for granted. 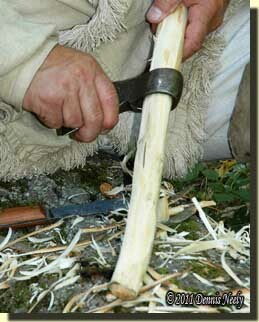 Forgot to say that I have read (and will need to look for the citations later) that sometimes a piece of deer hide was used as a “gasket” of sorts not only on pipe tomahawks but also when fitting heads to handles. Please share the documentation when you run across it. That makes sense and salvages a loose handle that would otherwise have to be discarded. Please keep us posted. I just found this site this past weekend from a discarded Woods and Water News. I was reading this post and reminded me of a long time ago, (last year), I reforged a hawk head from a drywall axe found in a trash can with a broken handle. It was a learning experience for sure, now i’m hooked. I recieved a .32 cal muzzle loader for my birthday and have been using it exclusivly for small game. Thanks to a Backwoodsman magazine I have been inspired to make all kinds of things to go with it, capote from an army blanket to a knife from a broken sheep shearing scissor. Sounds like you’ve started down the path to yesteryear.